Programmable logic controllers are known as PLC which is a basic element of any sort of industrial automation and process control automation. Hence this is also known as PLC automation. Nowadays any sort of machinery is having some sort of PLCs to control various functions. 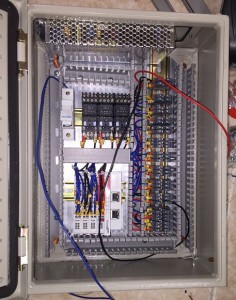 A Programmable logic controller (PLC) is basically an input-output device. It receives various input signals and processes these signals and generates output signals based on these input signals. What sort of output signals to be generated, what combination of input signals should generate what sort of output signals etc. can be programmed in the PLC. This programming once done will be retained in the PLC even in the case of power failure. PLCs are reliable devices which work for a long period of time. Eg. In a CNC machine a PLC can be programmed in such a way that if there are no steel plates in the machine, the machine should be automatically switched off. This is achieved by checking whether there is any steel plate left in the bed using sensors. This sensor will continuously give input to the PLC. As soon as the sensor detects that there is no steel plate left on the bed, the PLC gives an output as programmed to switch OFF the machine. All sort of automation carried out using a PLC are generally known as PLC automation. A PLC can be compared to the central processing unit (CPU) of a computer which processes numerous signals reliably. Apart from the PLC, there are numerous other components in a PLC automation. These include various sensors, mechanical, electrical and pneumatical control devices etc. There are reputed PLC manufacturers such as ABB, SIEMENS, Allen Bradley, Beckhoff, Kinco, Omron, Rockwell automation etc. The fundamental principle of all of these manufacturers are same but varies in various functionalities provided in each model, their programming language etc. A PLC system is designed through a ladder scheme which is a structured design pattern depicting the operational sequences required. After generating an Input-output list (I/O list) you will come to know the number of inputs and outputs required by you. It is a wise idea to consider an adequate number of spares for future usage. Based on the IO list and other functions required, you will be able to decide the right PLC required by you. Vacker provides all types of PLC automation projects in all cities of United Arab Emirates covering Dubai, Abu Dhabi, Sharjah, Al Ain, Ajman, RAs Al Khaimah, Fujairah and Umm Al Quain.